Brando stayed with puppy-sitter Chris Harrell while we were on our trip to the East Coast, and he looked noticeably larger when we reclaimed him! He’s growing so fast. I was pleased by Chris’s comment that he seems to have an “old soul.” I agree. 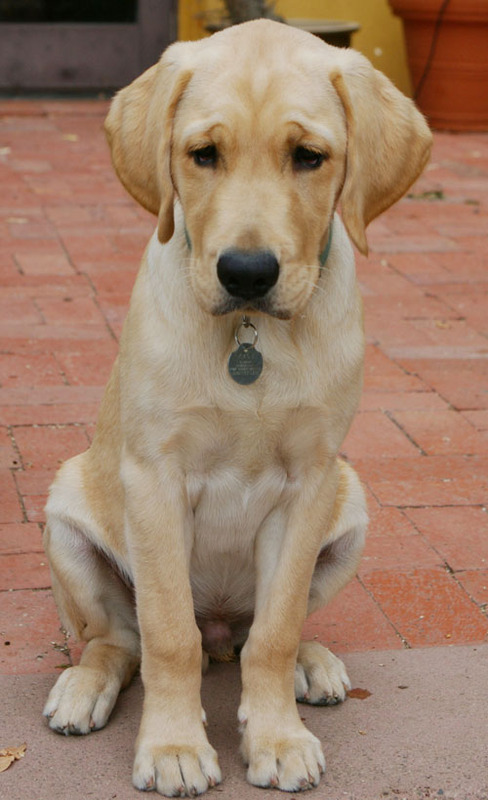 And yet he’s still very much a puppy. For my money, one of his more endearing habits is to sit with his tail curled under him — and then to wag it! I don’t know how he does that. A Water Dog? Maybe. 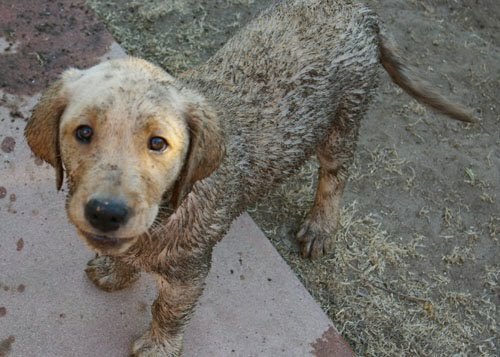 A Mud Dog — Definitely! Steve and I decided the other day to give Brando his first real swimming lesson. There’s a constant danger that he could fall into the pool by accident, and it would feel good to know that he could get out safely. So we took him into the pool with us and watched with pleasure as he paddled from one of us to the other. He seemed more relaxed and calm in the water than any dog we’ve had since Astra (our very first dog, acquired back in the late 1970s). After a while, I led him up the stairs and out of the pool. At which point he immediately ran to the nearest patch of dirt and rolled himself frenetically. Think of breading pork chops for the frying pan — only this was Brando, coating himself with a nice thick layer of mud. He was almost black. The only thing we could do was to give him a full-on bath. He hasn’t been back in the pool since then — about which we feel some relief!